Following the summer success of Pokémon Go, all signs point to augmented reality (AR) as being the next big thing in tech. In fact, Apple’s Tim Cook recently suggested that we will soon wonder how we ever lived without it. Though often confused with virtual reality, AR actually works to blend digital images with the real world, and a plethora of cases are already being tested. With the latest speculation that AR will even be incorporated into the next iPhone camera, this technology seems destined to rule our future. With the recent addition of world lenses and its first wearable accessory, Spectacles, Snapchat has firmly asserted its intent as one of the first big contenders in AR. With an existing base of more than 100 million daily active users, Snapchat is well poised to be widely adopted. For now, the AR functionality is mostly entertaining (think: golden butterflies swirling in the background) but as they continually seek opportunities to monetize their audience, they will be one to watch in 2017. Blippar is one of a handful of apps that are using AR to help users discover the world around them. Functioning a bit like a dynamic Wikipedia, the app recognizes everyday items in your camera’s field-of-view, and subsequently populates facts about them. Additionally, Blippar is already offering some early opportunities for advertisers, including exciting AR experiences for users who “blip” sponsor brands. GlamScout by FaceCake is just one of many AR shopping apps that allow users to try products virtually before they buy. Unlike Ikea and Converse, who have each released augmented experiences specific to their product lines, GlamScout aggregates beauty looks from a variety of retailers and groups them by price-point. 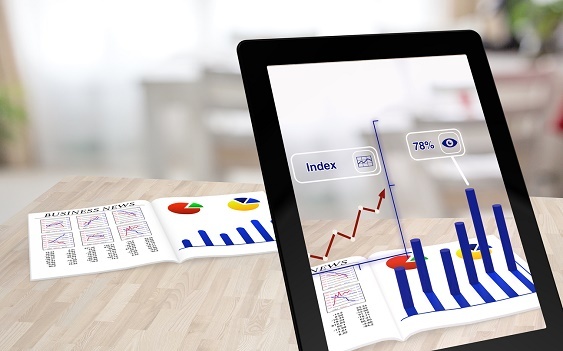 As mobile retail grows (to a forecasted $31 Billion in 2016) look for this to be one of the first industries transformed by augmented reality.